Prayer of the Day: Almighty and ever-living God, increase in us your gift of faith, that, forsaking what lies behind and reaching out to what lies ahead, we may follow the way of your commandments and receive the crown of everlasting joy, through Jesus Christ, our Savior and Lord. Unless you have spent the last two weeks on another planet, you know what has been taking place in the United States Senate. 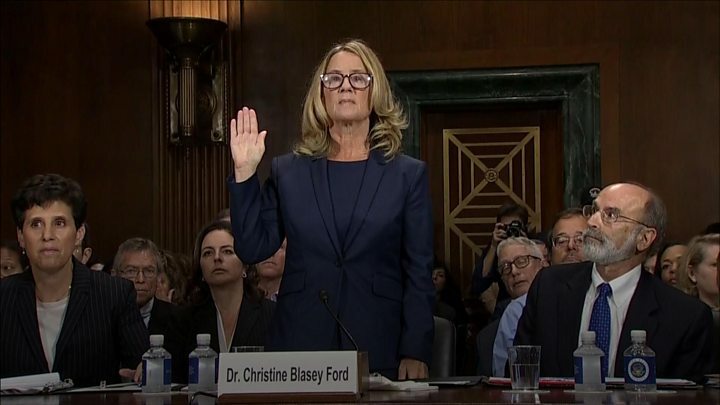 Dr. Christine Blasey Ford come forward to testify before the Senate, indeed, before the whole world, about the intimate details of the most horrific and traumatizing event in her life: a sexual assault by Donald Trump’s Supreme Court nominee, Brett Kavanaugh. For the most part, the Senators, even those who supported the nominee, treated her with courtesy and respect. They all agreed that her testimony was highly credible. Then the Senate went on to confirm Kavanaugh’s nomination and he was sworn in as an associate justice of our nation’s highest court. This, too, after his delivering an angry, vindictive and paranoid rant about conspiracies against him. The whole travesty was a replay of the confirmation hearing for Justice Clarence Thomas almost three decades ago during which his accuser, Anita Hill, received the same dismissive treatment. Then, as now, the fraternity of old men stood with their male nominee. The voice of a woman claiming sexual assault, however credible, cannot trump the presumptively valid denial of a man. You give us doting mothers, and chaste wives. We shall not get a poet, in my mind. Given the persistence of aggression against women by men and our society’s practice of silencing their cries for justice, I can’t help but suspect that Dr. Ford sometimes wishes she had just remained silent. This is “an evil time” and the “prudent” thing is simply to keep your mouth shut. Anyone familiar with the prophet Amos must know that his words to that effect in the above cited passage can only be understood as deeply sarcastic. Amos was anything but silent about the injustice surrounding him. He, too, was a vulnerable individual, being an immigrant to the Northern Kingdom of Israel from the Southern Kingdom of Judah. When you are considered an outsider, you have to know that meddling in the politics and religion of your host nation will not make friends for you. Keeping quiet about such things is the way of prudence. But for Amos, faithfulness took precedence over prudence. He spoke such words as the land of Israel was “not able to bear.” Amos 7:10. Like Dr. Ford and so many women seeking justice, Amos was silenced. He was forbidden to prophesy any longer at the national temple in Bethel and summarily deported. Seeing this, we might well conclude that Amos’ big mouth only got him into trouble and that he would have done better taking his own advice to remain silent. and succeed in the thing for which I sent it. Isaiah 55:11-12. Therefore, in this evil time when it seems as though speaking out can only get us into trouble, we must nevertheless speak. Speak even when you are being shouted down; speak even when you are being ignored; speak even when it is disruptive; speak even when it seems as though your words accomplish nothing; speak even when your voice is shaking and your mouth is dry; speak even when your voice is tired, cracked and worn. Speak the word that is truth and let the chips fall wherever they may. Any one of us can be silenced, but the word of truth can never be erased. Here is a poem by Langston Hughes that urges us not to succumb to the darkness or acquiesce to evil in silence. It represents, I believe, the spirit of prophesy inspired by visions of the gentle reign of God that moves us to speak throwing caution to the wind. Source: Selected Poems of Langston Hughes (c. 1926 by Alfred A. Knopf, pub. by Random House, LLC, 1990). Langston Hughes was an important African American voice in the “Harlem Renaissance” of the 1920s. Though well-educated and widely traveled, Hughes’ poetry never strayed far from his roots in the African American community. Early in his career, Hughes’ work was criticized by some African American intellectuals for portraying what they viewed as an unflattering representation of back life. In a response to these critics, Hughes replied, “I didn’t know the upper class Negroes well enough to write much about them. I knew only the people I had grown up with, and they weren’t people whose shoes were always shined, who had been to Harvard, or who had heard of Bach. But they seemed to me good people, too.” Today Langston Hughes is recognized globally as a towering literary figure of the 20th Century. You can read more about Hughes and discover more of his poetry at the Poetry Foundation website (from which the above quote is taken).